Buenos Aires is often called the “Paris of South America,” for its stunning architecture, cosmopolitan atmosphere and rich European heritage. The neighbourhood of Recoleta, and especially Avenida Alvear (Alvear Avenue), still reflect the opulence and grandeur of the 20th century when Buenos Aires was one of the wealthiest cities in the world and its prosperity was reflected in its palaces and other uniquely designed buildings. We knew that we were in for a treat when we booked our stay at the Palacio Duhau – Park Hyatt Buenos Aires in Avenida Alvear. This was confirmed by our local Buenos Aires tour guide, who drove us through this elite avenue during our city tour, and told us that the city’s most exclusive places to stay were located here. As we drove up to the hotel a few hours later, bellboys stood at attention, as if anticipating our arrival. The car doors were opened, we were welcomed, and our luggage was taken care of seamlessly. Our sense of anticipation was heightened as we took in the grand façade of the hotel and entered the opulent lobby through gilded doors. Marble floors, crystal chandeliers and elegant furniture dazzled us even further. After the check-in formalities were completed, we were greeted by our personal butler who led us to our room, where she showed us around. The room was not just a room. It was a massive suite with a walk-in closet, and a huge bathroom. That was just for my husband and I. My children had their own inter-leading room and bathroom. We had a king-sized bed, a work area, and a lounge area, all spaced well apart. The beverage station had a Nespresso machine and a minibar. Entertainment included a LCD TV, a DVD player and a CD player. Large windows overlooked the palace building and the beautiful green gardens, which were like a welcome oasis in the bustling city. After more than a week of exploring South America, we decided that this was the perfect place to put our feet up and relax. We would just stay in and enjoy our lavish surroundings. A while later, a decadent dessert platter was delivered to our room to add to our enjoyment. The marble bathroom had double vanity stations, a toilet with a bidet, a walk-in rainshower and a wonderful spa bath, which I took full advantage of. Plush slippers and gowns were provided. The walk-in closet was spacious and contained a personal safe with a built-in laptop charger, something I haven’t seen that often. Palacio Duhau consists of an exquisite French-inspired palace, built in the early 20th century and a separate more contemporary building. They are connected by the beautiful gardens on the ground level and an underground corridor with an art gallery and boutique stores at the basement level. The boutique stores include a pâtisserie, a bespoke tailor, an art and design store and a florist. I loved admiring the floral creations every time I passed the latter. The in-house Ahín Wellness Spa consists of serene spa suites with beautiful views of the gardens, a hydrotherapy room, a state-of-the-art fitness studio and the largest pool in Buenos Aires, a 25-meter heated indoor pool. A well-equipped business centre provides full business services. The hotel has a range of dining options and cuisines, including Argentinian and Italian. Breakfast is offered at two different restaurants as well as in-room. We opted to have ours at Gioia Restaurante & Terrazas where we sat in the beautiful gardens and enjoyed freshly-made eggs, smoothies, pastries. The children relished their French toast and waffles, with fresh cream and berries. Afternoon tea and all-day snacks are served at Los Salones del Piano Nobile, the Palace restaurant, and its delightful outdoor terrace. The service was impeccable. Staff were friendly and efficient, and spoke perfect English, which was uncommon in Buenos Aires. One of the staff members told me about how she had visited Johannesburg and Kruger National Park, and was awestruck at seeing such beautiful animals on safari. An interview with the Concierge on the hotel’s website mentions how a guest wanted to go to the South Pole in Antarctica to see the penguins for just one day. The hotel made it possible. Palacio Duhau is consistently listed as one of the best hotels in Buenos Aires. It is easy to see why. Classic elegance and charm blend perfectly with modern comforts in this prestigious Park Hyatt property. And after all, how often does one get to stay in a palace? 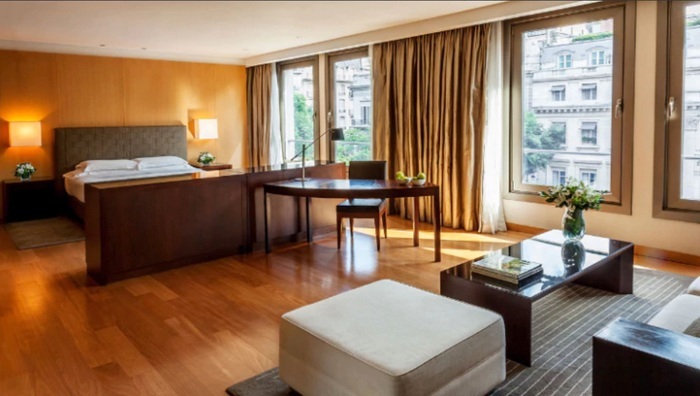 For more information, visit Palacio Duhau – Park Hyatt Buenos Aires or book here. A very beautiful place. Thanks for the interesting article and photos! Wow this looks beautiful! Would love to experience a stay here, you truly do get treated like royalty! Love love love! Looking at the pictures of the hotel and the grand and cozy room I would have cancelled all the plans and stayed back in the hotel, enjoying every inch of it! Loved how elegance and opulence is combined with the modernity here! Defiantly going to consider this hotel for stay when I visit Buenos Aires.. I first learned about the fancy lifestyle of Buenos Aires in a travel book by Paul Theroux. 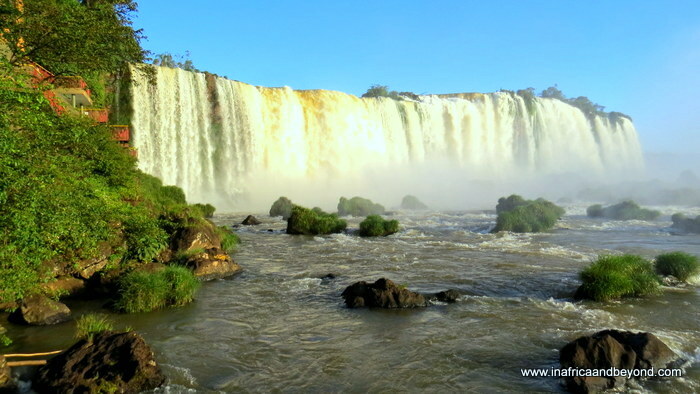 It is interesting to read about the luxurious hotels of Buenos Aires. The chandelier in the crystal room is grand. The room has a royal feel to it! I loved the understated and classy décor of the room. I think I can plan an entire vacation around this hotel!! I love facades so the entry in itself intrigued me and those chandeliers are just gorgeous!! I love Italian food and a hotel serving one in the buffet is my kind of hotel 😉 Thanks for the wonderful recommendation!! A fellow South African… Hi… Great post! Wow did you leave your hotel at all? This place looks amazing and so elegant! That breakfast… I would have one of each. It really does look like a hotel you would find in Paris the perfect place to relax and get pampered. Palacio Duhau in Buenos Aires is that kind of place I can only dream of to stay! The room is incredibly big and just by looking at the picture I am sure the hotel room is bigger than my flat! It must have bern nice having a delicious breakfast on that garden and perhaps take a swim in their gorgeous swimming pool! Yeah, I could stay here. That suite is no joke. One of the things I love about the more prestigious hotels is that the cuisine is infinitely better. I can imagine nibbling on those pastries on the lounge chairs all day long! This place is absolutely incredible! I can seriously see why Buenos Aires is called the Paris of South America. I’m completely in love with your suite, and there’s nothing more luxurious than a marble bathroom, just exquisite. I’ll definitely be booking a stay here when I get to BA. Thank you!